I use avocadoes so frequently that I buy them rock hard and keep them in the refrigerator for a slow ripening process to avoid over-ripening, and then I always have a couple of ripe avocados ready to go. 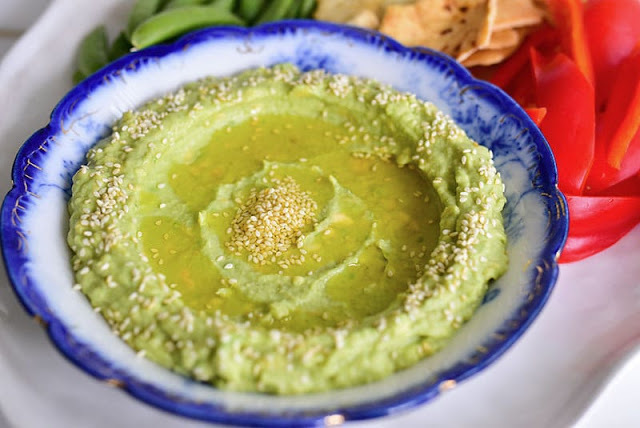 Avocado tahini makes a great dip for pita chips, crudité, tortilla chips, and a delicious spread for pita rolled sandwiches, burgers, kofta, chicken sandwiches . . . you get the idea. To make ahead, store in an airtight container in the refrigerator, brushing the top of the avocado tahini mixture with lemon or oil to prevent browning. Wait until serving to plate the avocado and top with olive oil and sesame seeds. 1. Scoop the avocado into a medium bowl and stir, mashing with a fork or masher as needed, to get to a spreadable, somewhat chunky, texture. 2. Add the tahini, salt, garlic, and lemon juice and stir well to combine. Taste and adjust seasonings as needed. Transfer the mixture to a flat serving bowl or a plate and using the back of a spoon, make a well in the center. Drizzle with olive oil and dust with sesame seeds. Serve immediately.